Sitting in the middle of Laguna de Bay, the Wonder Island Resort is a perfect venue for every occasion. This place is very close to my heart as this is where my husband and I got married . 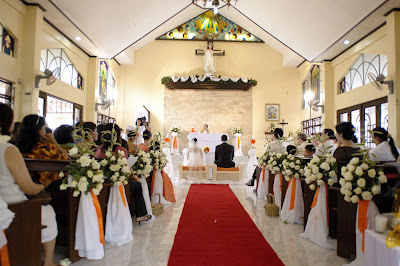 The ceremony was held in their chapel and the reception in their conference hall. Since I am based in Switzerland, I availed of their wedding package because I really didn't have time to fuss over flowers and tablecloths. I arrived in the Philippines just 1 week before the wedding to fit my dress. Aside from the invitations which were designed, ordered and sent out by my sister, all the other details of the wedding itself I left to the people of Wonder Island. They didn't disappoint at all! Everything was arranged to perfection! The flower arrangements were beautiful, the chapel was beautiful, and most importantly the food was good. It was perfect! Our wedding was perfect and quite hassle-free! Apart from weddings, I think it is also possible to go there for a day or for a weekend, and for seminars and conferences. There are two air-conditioned dormitory units with a capacity of 20 persons per unit; two family units (for 6-8 persons in a unit), with 3 air-conditioned rooms each; and a complete 2-story bamboo house (maximum capacity: 12 persons). There are also 6 swimming pools of various sizes and designs, a view deck, 2 jacuzzis, a 2-story conference hall for seminars and social functions, and a sports hall. Wonder Island Resort 0063(0)49- 545-1766 and 545-6491. Day rate: Adults P784; Kids P700; Senior Citizens P690. Rates include use of swimming pool, food, boat transfer, picnic huts. P.S. Their chicken galantina is really really really good. I added their website to my post. When you arrive in Calamba (crossing), just follow the sign "to Wonder Island" which is everywhere. After a seemingly endless journey through small and narrow roads you will arrive in a wharf where you can board a boat owned by the island. If you are using public transportation it is easier because just tell the tricycle driver that you want to go to Wonder island in Calamba crossing. For room rates you would have to call them 0063(0)49- 545-1766 and 545-6491 or visit their website. Maybe it is better to call first because I don't know if they always have a boat waiting. In the worst case if you can't see any sign, just go to their booking office located near the house of Jose Rizal in Calamba (address in the brochure in the post). It is a big house with a big lawn. hi. i hope you won't mind my asking, but how much does the wonder island wedding package cost? just checking if it fits our budget. thanks. Thanks a lot. That sounds reasonably priced. I'll inquire about their wedding package. is there room for two persons only? is there overnight stay?